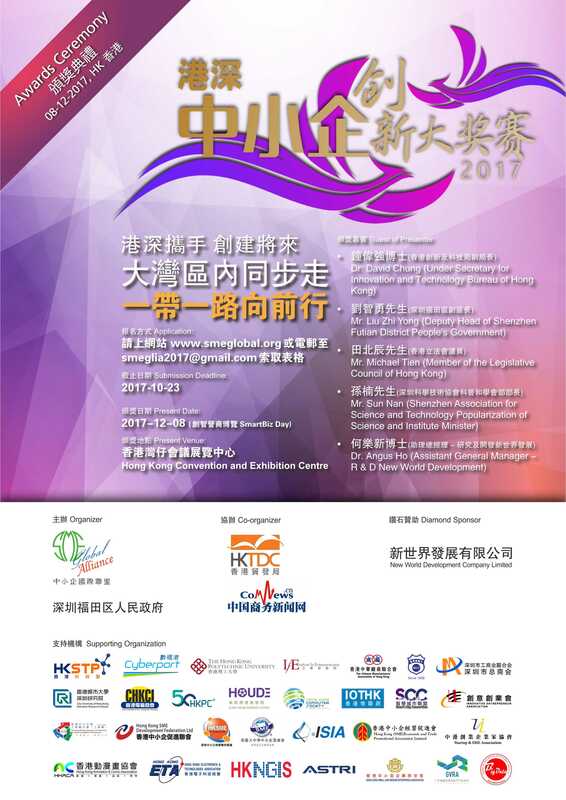 It is my pleasure & honour to welcome you to the Awards Ceremony of this very first HK SZ SME Innovation Award 2017. SME Global Alliance has always been encouraging SMEs to make good use of the latest technologies to innovate, to expand markets, and to enhance quality and efficiency. Based on the outstanding result of last year’s HK SME Innovation Award, we persevere and extend our reach to Shenzhen. With the support of the Futian government, sponsorship from the New World Development Group, and the assistance of various supporting organizations, we have successfully conducted the assessment, and hopefully will bring the competition to a higher level. This year’s theme is “HK SZ go hand in hand to build the future. Marching in GBA to move on OBOR" where GBA is the Greater Bay Area of Guangdong, HK & Macau, and OBOR is the One Belt One Road initiative. Through this contest, we want the participants from both HK & SZ to learn from each other and to share their experience in innovation, in order to increase their chance of cooperation. Firstly, we did the mass selection in SZ, then the final in HK on 3rd November. Now, we have invited many potential investors, commercial counselors of various countries, executives of co-working spaces, and so on to attend this Awards Ceremony held during the HK Trade Development Council International SmartBiz Expo. SMEGL, as an exchange platform, liaises with related business associations and social enterprises to encourage those entrepreneurs of Hong Kong, Mainland and overseas extending business globally, visioning and accomplishing opportunities. We meet leaders of well-stated institutions of different places to open and strengthen ourselves one another. It thus supports one another to enhance the enterprise clustering for global economic and trading sourcing. It also effectively strategizes the industrial and commercial developments of Hong Kong and Mainland in order to cope with government supportive endeavour of their policies and behaviours. It steps out steadily with foundation move to integrate local and overseas insight and work, to contribute the community; to actively improve people’s living standard and environment. Direction and objective are to enhance the communication of entrepreneurs and professionals, deepening the relationship, creating the opportunity, constructing the capability, networking the belonging, promoting the social caring, making the harmony of society, and thus strong family and country!